I was raised during a time when nuclear testing was accompanied by air raid sirens. The sound of the sirens left an indelible mark in my mind along with millions of others. How many nuclear tests do you believe took place since the first one, on July 1945, before Hiroshima and Nagasaki? It might surprise you that a total of 2119 Nuclear Tests happened between 1945 and 2015. When we add in the number of non-yield tests the total jumps to 2474. A non-yield tests draws a fine line between a full blast by saying that a nuclear test was not intended. It is the same as saying sorry when I picked up the gun it fired in your face. 1. 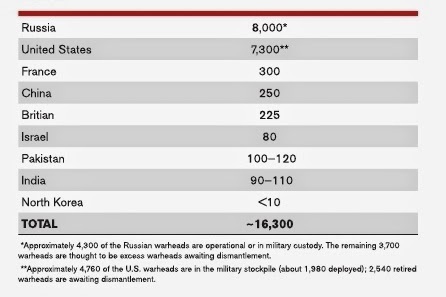 How many nuclear weapons exist today? 2. 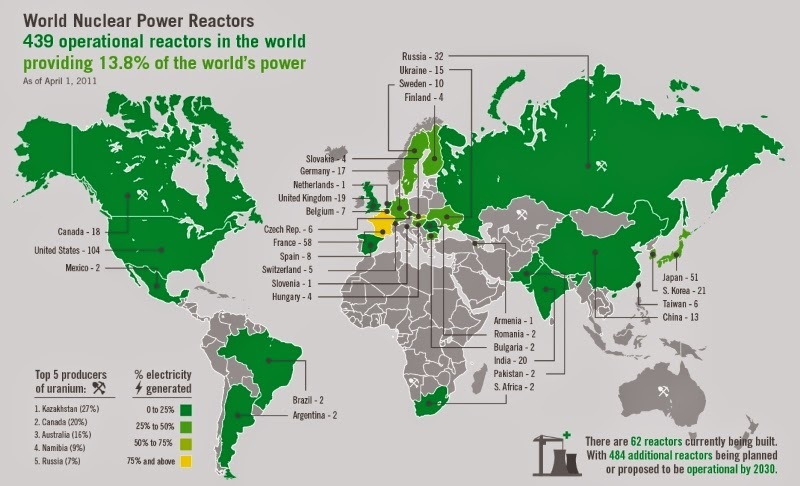 How many nuclear reactors are in use now? 3. Where is the deadly toxic waste located? 4. What can we do with the toxic nuclear waste? The number of weapons is in decline from 70,000 during the late 1980s to approximately 16,000 today. The graph is from the Bulletin of the Atomic Scientists. What do We do with the deadly Nuclear Waste? As you can see from the graphs the planet is awash with toxic and deadly nuclear waste by-products. Low radioactive waste such as clothing, filters and some resins need to be stored for at least 500 years. That is a best guess on how long it takes for the radioactive waste to decay to a daily dose of radiation. We began playing with nuclear radiation in the early 1940s so any date of expiry must be a best guess. Here is a quote from the United States Nuclear Regulatory Commission: "Because of their highly radioactive fission products, high-level waste and spent fuel must be handled and stored with care. Since the only way radioactive waste finally becomes harmless is through decay, which for high-level wastes can take hundreds of thousands of years, the wastes must be stored and finally disposed of in a way that provides adequate protection of the public for a very long time." Where does the low and highly radioactive nuclear waste really go? This video explores the topic. You can find 1000s of videos on this topic around the Internet. I picked this one because of it's shock factor along with the nuclear waste being dumped in the Oceans. The fact is every country using nuclear fuel or has nuclear weapons did little or no planning for the toxic waste. Waste includes that from Nuclear Power Plants, Nuclear Weapons, Nuclear powered submarines and ships, hospitals, research facilities and a wide array of Military Weapons. Fukushima released 13,000,000,000 times more neutrons than initially estimated. Neutron radiation is the most severe and dangerous radiation known to mankind. It can travel great distances. With over 100,000 tons of nuclear waste world wide here are a few options. Keep dumping it into the oceans, rivers or simply bury the stuff deep into our planets surface. The diagram shown above is on the drawing board in Canada just 2 km from the Great Lakes. Currently 29,000 tonnes of toxic nuclear waste is stored near the Bruce Reactors. Several sites, with nearby cities, are going through the process of getting to be the lucky one. 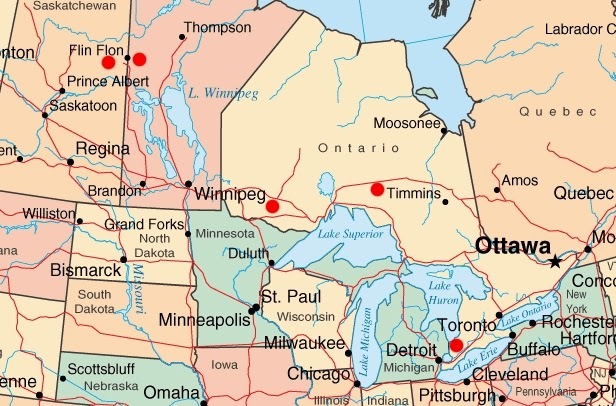 The next diagram shows three of the five possible dump sites in Ontario, Canada. Recently Flin Flon, Manitoba had their name added to the possible nuclear wast dump sites along with Creighton, Saskatchewan. It gets a little bit confusing with the North Western Ontario site at the top of the map. A number of smaller communities are considering a yes vote. In truth no one is going to get to vote on the final choice. 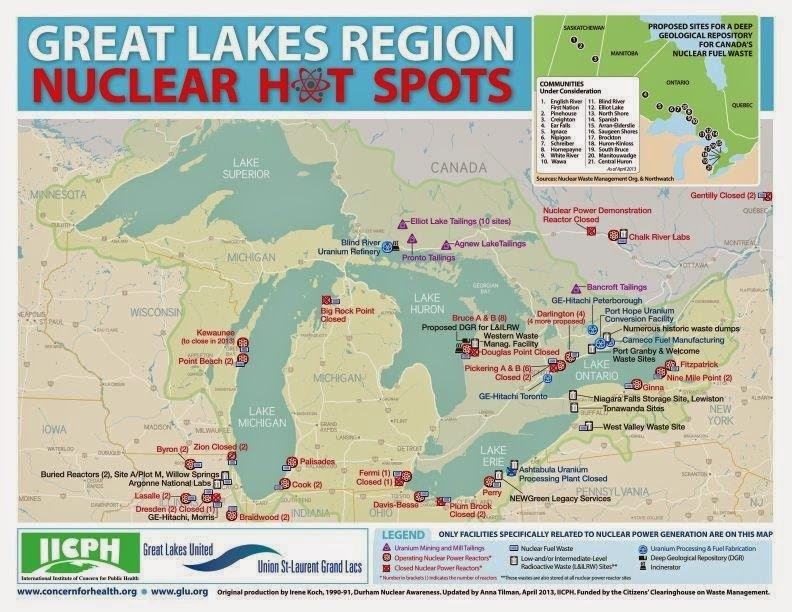 While keeping an eye on the map above take a look at the nuclear waste around the Great Lakes of Canada and the United States. Between 40-50 million people, on both sides of the Great Lakes, depend on the clean fresh water supply for everything. Contrary to George Bush the Lessor the water flows from Lake Superior to the Atlantic Ocean. Lake Michigan flows in part, to millions of people, along the Mississippi River. How is the deadly toxic nuclear waste going to get to the proposed nuclear dump? Railway because everyone knows they seldom have accidents. Massive trucks clogging up the narrow highway is another option. With the dump site in North Western Ontario, closer to the city of Thunder Bay, the Great Lakes Fleet could take the waste north. Imagine the impact a ship loaded with nuclear waste having an accident as it enters Lake Superior. Business Owners on Nuclear Waste in NWO. Local business owners comment regarding a potential deep geological repository for nuclear waste at MP Bruce Hyer's Town Hall meeting in Manitouwadge. Edwards said history of full of examples in which toxic materials have been disposed of through burial only to 'come back to plague future generations.' He mentioned the famous case of Love Canal, a neighborhood in the US built atop a toxic waste burial site. The waste was linked to health problems and the government paid to relocate hundreds of families. Edwards further referenced Sarnia, Ontario, where toxic chemicals were injected deep into the earth only to resurface in the St. Clair River as toxic blobs thanks to Dow Chemical. CCNR is a not-for-profit organization, federally incorporated in 1978. It is dedicated to education and research on all issues related to nuclear energy, whether civilian or military, including non-nuclear alternatives, especially those pertaining to Canada. Ignace along with three other communities have advanced into the next research phase as potential sites. The area is now under evaluation by The Nuclear Waste Management Organization (NWMO) to decide which community is the best possible site. Physics Stack Exchange is a question and answer site for active researchers, academics and students of physics. technical, cost, safety, security and regulatory issues through research, development and demonstration. By focusing on the development of advanced nuclear technologies, NE supports the Administration’s goals of providing domestic sources of secure energy, reducing greenhouse gases, and enhancing national security. The resolution, co-sponsored by Sens. Debbie Stabenow, D-Mich.; Mark Kirk, R-Ill.; and Tammy Baldwin, D-Wis., urges President Barack Obama and Secretary of State John Kerry "to take appropriate action to work with the Canadian government" to prevent building of a permanent nuclear waste repository within the Great Lakes Basin. Humankind has already produced so much nuclear waste that it would take decades, if not hundreds of years to process and recycle it. As of now, the only light at the end of the tunnel is fast-neutron reactor technology. Fuel for breeder reactors could even be made from nuclear waste, which from an ecological point of view is a priceless advantage. I will do my best to keep you updated in future blogs.